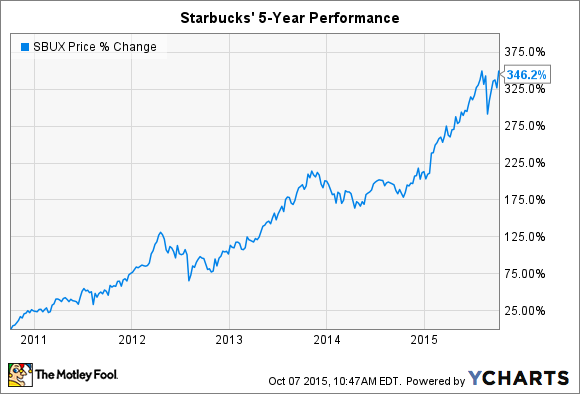 Starbucks Corporation Stock: Up 60%, but Still a Buy? Investors can't get enough of the coffee giant's shares these days. Investors are about as crazy for Starbucks' (NASDAQ:SBUX) stock as coffee drinkers are for this fall's pumpkin spice latte, the most popular seasonal beverage of all time. Shares are at least as frothy as that caramel-topped drink: They're up 60% in a year, and higher by 350% during the last five years. Should that recent record keep prospective investors on the sidelines with this stock, or is it just another step in a long-running trend of outperformance by the coffee giant? Let's take a closer look. There's no doubt that Starbucks' business is firing on all cylinders right now. Customer traffic was up a whopping 4% last quarter, powering an industry-beating 7% bounce in comparable-store sales. Mobile pay should help Starbucks process record traffic this holiday season. Source: Starbucks. While 4% might sound tiny, it's actually massive for a company of Starbucks' size. It translated into 23 million more customers served last quarter, or 25 additional shopper transactions every day -- at each of the company's 10,000 locations. That surging popularity is a big reason why throughput, or quickly processing the crush of shoppers, is management's key priority heading into the holiday shopping season. Not only is Starbucks attracting more visits, but it's doing so through an expanded food menu. And that shift allows it to capture revenue in traditionally slower periods like the lunch and dinner hours. Food has been stuck at 19% of the retailer's sales for years, but management sees that figure climbing toward 25% of sales in the coming years. Wall Street is clearly excited about the financial implications of Starbucks' growth strategy. Besides the optimistic signal being sent by a record stock price, the retailer also just received glowing praise from Moody's, the debt-rating agency. While upgrading its bond rating, Moody's highlighted Starbucks' "strong and consistent operating trends driven by new product offerings, greater day part diversity, well accepted loyalty program and e-commerce initiatives that have resulted in strong credit metrics and excellent liquidity." The research service said its confidence was boosted by the retailer's "global brand strength, dominant position in the U.S. specialty coffee segment, global diversification, significant scale, and balanced financial policy." What's not to love about all of that? The biggest risk for investors looking to buy a piece of such a high-performing business is in paying too much. And Starbucks has grown more expensive lately -- no matter which way you look at the stock. It's valued at 33 times trailing earnings, up from 25 times at the beginning of this year. Investors are also paying nearly five times sales to own shares. That figure was as low as 0.5 times sales at the bottom of the financial crisis, and hasn't been this high in more than a decade. SBUX PS Ratio (TTM) data by YCharts. But here are two other numbers that haven't ever been this high for Starbucks: earnings and profitability. Operating income soared 22% higher last quarter as profit margin expanded by almost a full percentage point to hit 19.2% of sales. 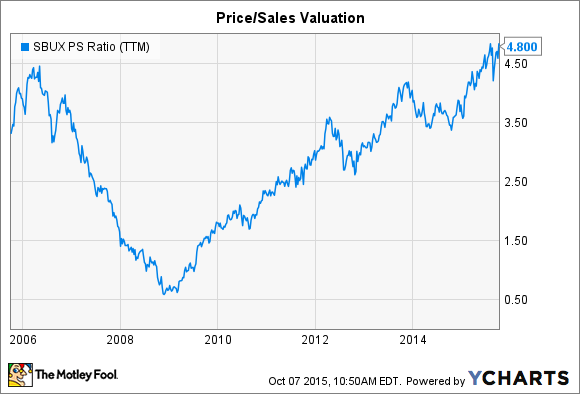 While the beverage giant is expensive right now, it's not absurdly so. And in light of the market-thumping business trends and broadly improving finances, I think investors have a decent chance of getting a good long-term return even from today's prices. There's no telling which direction the stock will go during the next year. But Starbucks is one of the world's most valuable brands, and its operations are growing more diverse even as they improve on the core coffee experience. In my view, that all adds up to a stock that's worth the spicy premium.